Based on the musical written by Alain Boublil and composer Claude-Michel Schönberg (with English-language lyrics by Herbert Kretzmer), Tom Hooper’s Les Misérables opens up the teeming fresco of squalor and upheaval beyond the limitations of the theater. This story of oppression, liberation, and redemption produces a swooping, splashy cinematic panorama of an unjust, compassionless, unfeeling world, in which the innocent and the idealistic pay for crimes they have not committed, and plants a seed of barely flickering hope. A work of audacious ambition, Les Misérables, Victor Hugo’s 19th century 1,400-page historical novel of rebellion and romance ran the emotional gamut, and the film, as well, sweeps viewers on a stirring, swelling wave of feeling that will leave few eyes dry. Mixing gritty, grimy realism with the artifice of stage production, Hooper brings Hugo’s characters to celluloid life with gusto and grace. This sprawling, splendid spectacle gives hints of its impressive scale and scope as early as the opening scene. Set in 1815 France, the first number, “Look Down,” takes place in a grand, digitally enhanced port where a chain gang toils to tow an enormous ship into a dock, lifting their voices if not their heads. 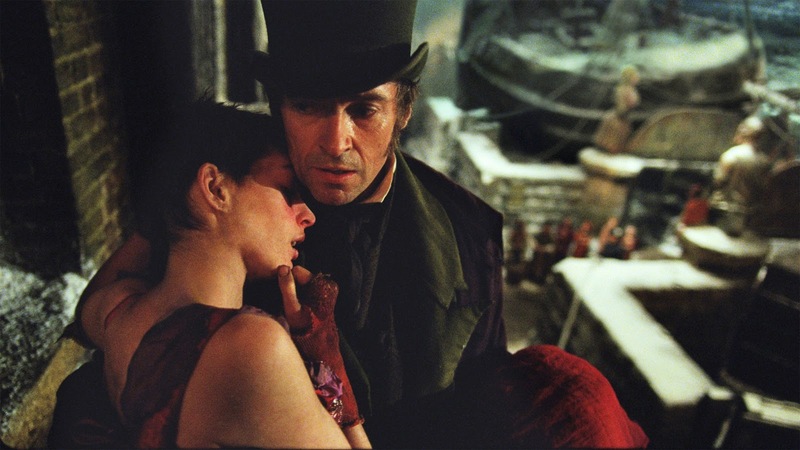 Among the dozens of slaves is Jean Valjean (Hugh Jackman), known to overly dutiful guard Javert (an imposing Russell Crowe) only as prisoner 24601. Imprisoned for almost 20 years for stealing a loaf of bread to feed his sister’s child, Valjean is released, but not without stigma and stringent parole conditions, which he will break. Eight years later, the hero is a prospering factory owner and mayor of a small town under an assumed name. Javert, promoted to police inspector, cannot give up his obsessive search for Valjean. He almost gets discovered while helping Fantine (Anne Hathaway), a prostitute and former employee he unintentionally wronged. The defeated, demoralized unwed mother is fatally ill, but before she dies he promises her to take care of her daughter Cosette (played as a child by Isabelle Allen and as a young woman by Amanda Seyfried), now in the care of disreputable inn keepers the Thérnadiers (played with venal, unsavory flair by Helena Bonham Carter and Sascha Baron Cohen, who seem to be reprising their grotesque roles from Tim Burton’s Sweeney Todd, bringing some welcome, lecherous comic relief to the otherwise grim proceedings). Valjean’s fate is joined to that of the young revolutionaries of 1832 Paris when the waifish, cossetted Cosette falls in love with student leader Marius (a phenomenal Eddie Redmayne), who is, in turn, pined over by Eponine Thérnadier (stage actress Samantha Barks). Rebellion and relationships bloom, bringing everything together to a fittingly grand, heartrending final set piece. Les Misérables is, in fact, a collection of set pieces and solos. With only minimal spoken dialogue and no dancing, the movie resembles opera more than a musical, the powerful vocals and stirring score propelling the action forward. All the songs are recorded on set directly by the camera, with no pre-recording or lip-synching (the regular technique used in most musicals), a bold gamble that pays off in spades of spontaneity and energy. The music isn’t slick, and there’s more strain than soul to a few nasal performances, but when the actors hit the notes—and most of them do so beautifully—the film rises with raw, ragged intensity and trembling emotion. No example is better than tragic heroine Fantine’s agonizing rendering of “I Dreamed a Dream” in the character’s lowest and the film’s highest point. Shot in a single, shattering closeup take to better capture Hathaway’s gaunt, dirty face, cracked lips, angular body, and cruelly shorn hair, the song summarizes the anguish, passion, defeat, and defiance of the entire class of downtrodden, marginalized, misunderstood unfortunates of the title. And Hathaway can sing. Her eyes filled with tears, lips trembling, she doesn’t go off key until the very last line, which gets stuck in her throat in a flurry of feeling. All of the actors do an excellent job, with standouts Hathaway, Redmayne and Jackman topping the list. Anne Hathaway’s role is brief but electric; Fantine’s tale will stay with us even after the film itself has faded. 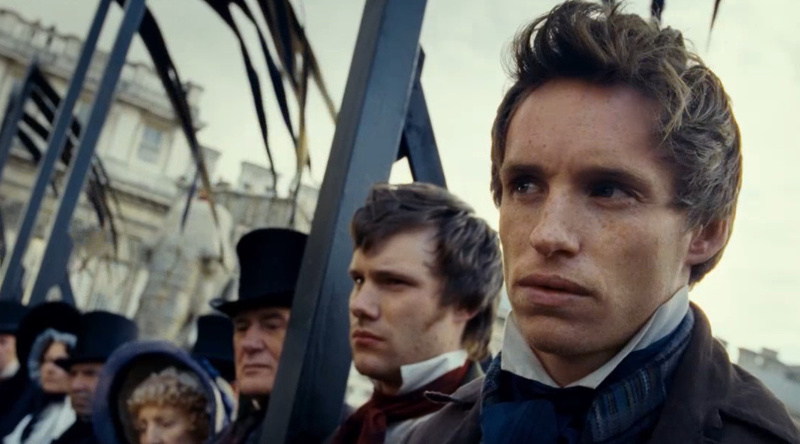 Eddie Redmayne, who played the young production assistant in My Week with Marilyn, is moving and memorable as Marius. He shows off his singing chops, displaying a smooth, strong voice, especially in “Empty Chairs at Empty Tables,” a heartbreaking tribute to his fallen brothers. As the sinner-turned-saint Valjean, Jackman sometimes misses the high notes, but he embodies the role with warmth and nobility. Russell Crowe has a less forceful singing voice than the rest of the cast members, apparent especially in his duet with Jackman, a song of interweaving melody lines performed while dueling. 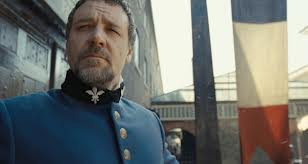 Crowe’s mellow, moody crooning does justice to Javert’s mournful ballad “Stars,” however, whose naturalism and immediacy stand in stark contrast to the other actors’ belting bravado. Young scene-stealer Daniel Huttlestone makes a delightful impression as impish street urchin Gavroche. Hooper and cinematographer Danny Cohen mix scenes of overwhelming vigor and dynamism, shot with a nimbly circling, swooping camera at confidently slanted angles, with the quiet, poignant stillness of dramatic solos (more akin to their previous collaboration, the Academy-Award-winning The King’s Speech). Their highest achievement is capturing the atmosphere, the muck, almost the smell of nineteenth-century Paris and the soaring revolutionary spirit that made for a glimmer of hope, sometimes against all odds.